Google Home Mini,powered by Google, gives you dynamic sound that fills the room. Its speaker delivers 360° sound to bring your music to life, and can stream your music through your Google Assistant-compatible speakers. Want to know if you'll need an umbrella the next time you head out? Ask Google, and Google‌ Home Mini will let you know if any rain is expected. You can also get the latest sports, finance, news updates, and more. Take control of your home using your voice with the Google‌ Home Mini. With Google Assistant voice commands built-in, it lets you control your smart home gadgets hands-free. Use your voice to dim the lights, adjust smart thermostats, lock your front door, play music from WiFi-connected speakers, and more. Just say "OK Google" followed by your command, and Google Home Mini will take care of it. Stay organised by asking Google to manage your schedule. Mark dates in your diary, set reminders, alarms, and more. Play, pause, and rewind TV hands-free, using your voice. 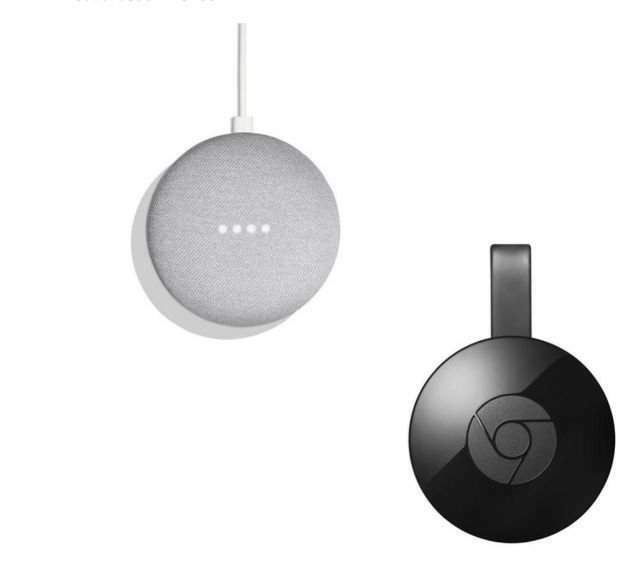 Google‌ Home Mini works with your Chromecast, letting you stream TV shows, movies, and music from compatible content providers and products. Get even more from Google Assistant by asking Google anything. Ask for things such as translations, calculations, unit conversions, and anything else you want to know the answer to. Google‌ Home Mini supports multiple users. That means it can give you a personalised experience by differentiating your voice from other people in your home. Just say "OK Google" and enjoy your own unique benefits from Google Assistant. Chromecast is a media streaming device that plugs into the HDMI port on your TV. Simply use your mobile device and the TV you already own to cast your favourite TV shows, films, music, sports, games and more. 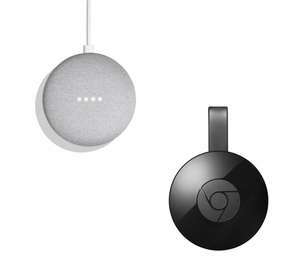 Chromecast works with iPhone, iPad, Android phones and tablets, Mac, Windows laptops and Chromebook. With Chromecast, your phone is your remote. Simply tap the Cast button in your apps to start watching on the TV. Search, play, pause and more, right from your phone. See anything on your Android phone or tablet on your TV, or use your laptop to cast any website from the Chrome browser. If it's online, you can cast it. Drat! Should have waited and ignored the Currys offer yesterday. Could have saved another 1p. which chromecast version is this and does it matter? Thanks for posting the deal! Coral not available, cold from me. Coming up as £60 for me. No discount. which chromecast version is this and does it matter? Thanks for posting …which chromecast version is this and does it matter? Thanks for posting the deal! Well that was quick. Manage to get one before it expired. Was planning to get more.